People have good ideas every day but few make it from the idea stage to fruition. That’s why I love it when a good idea becomes a reality and I believe that we should give it our full support. Recently I was thrilled to be invited to launch a recipe booklet called, “Make It Simple”. It was the result of a local committee initiative organised by the Home School Community Liaison Coordinators in St Oliver’s N.S., S.S. Peter and Paul’s and Colaiste Chluain Meala. I was very honoured to be chosen to speak at the event and was there in my capacity as Chairman of Tipperary Food Producers Network. This recipe booklet was inspired by a series of cookery classes for parents organised through the HSCL scheme in the three schools and funded by the VEC Community Education Programme. What a superb example of a practical way to get people involved with food and cooking. Schemes like this should be run in every school in the country. It is amazing the power of parents and it’s a power that is often ignored and negated. Parents, have the power to influence and change the world in their own home which will have a huge impact on their children. Most people do the best they can for their children with the result that most children lead lives similar to their parents. If you weren’t taught about food and nutrition as a child and you haven’t taken an interest as an adult, then it is likely that your own children will grow up without such knowledge either. Empowering parents with practical cooking skills and information on nutrition will naturally filter to their children, who are the adults and parents of tomorrow. Such was the enthusiasm of the parents on the cookery course that they decided to produce a booklet that incorporated the recipes they had tried and tasted that could be given out to all the parents. The children also had a vested interest and a role to play as most of the recipes included were ones that had been popular with them. The booklet provides parents with a selection of easy to follow recipes that include soups, main courses and desserts with an important nutritional tip included in each one. There are also added value educational elements to the book such as a section that talks about handy store cupboard items. I just loved the down to earth practicality of the list and, unlike some of our fancy lifestyle cook books, the ingredients listed are versatile, available and inexpensive. There wasn’t a jar of squid ink or obscure Japanese seaweed in sight! The list of kitchen utensils was also accessible, realistic and sensible. Easy to read conversion tables and measurements and weights tables are user friendly and all contribute to creating confidence in the booklet and in cooking skills. At the end of the day that really is what it is all about. Real food is something we need every day of our lives. It is hugely important to our health and well being as well as our local economy and giving people the confidence, along with the necessary step by step, no nonsense instructions is a great place to start. The recipes themselves cover all the bases from starters and main courses to desserts and snacks. Each recipe informs you how many people it will feed and the average cost per portion. This is a very useful guide and the financial savings alone in cooking for the family might just be the incentive we all need to get back into our kitchens and rattle those pots and pans. While the information and recipes are the same, each school involved has an individual front cover which was designed by a pupil; creating involvement and ownership of the project and making it unique to each place. Now that it’s published you have to wonder why it wasn’t done before but, as I said to the organisers, I am well aware of the great deal of work that goes into creating something like this. However the first one is always the toughest and now that they have a template of how to do it, perhaps Make It Simple II isn’t such a leap of imagination! Congratulations to all involved and maybe it is an idea that could be replicated in every school. Equipping people with simple skills and knowledge of food and cooking is so much more valuable than all the good nutrition preaching that has been going on. Cooking and eating real food will also tackle the obesity problem naturally without the need for reprimanding and scaremongering already stressed parents. Projects like this should be recognised and commended and I have no doubt that long after the excitement of the launch these recipe booklets will be used in local kitchens for years to come. Always remember good food is an investment in your future health and well being. I welcome your feedback to pat@jwb.ie Happy Easter. This post was written by me, Pat Whelan, owner of James Whelan Butchers and a passionate advocate of local artisan food. 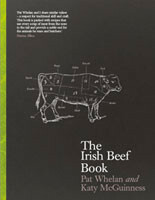 My family have been producing quality Irish Angus beef for generations using a traditional dry aging process. This tradition is one that I continue to practice at our abattoir on our family farm in Garrentemple, Clonmel. These posts aim to impart some of the wisdom to readers and help them get the best out of the meat they eat! Our meat is available here online!